This was taken at Rosskeen Bridge - Year unknown. 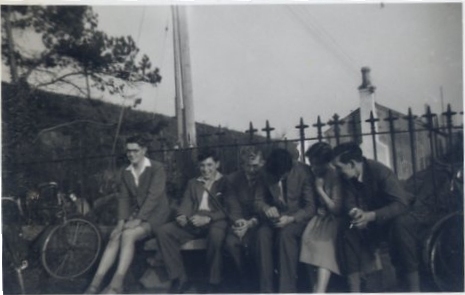 Left to right: Robert Kerr, Gordon Gibson, Charlie MacKay, ?, ?, ? Reminds me of the time Gordon Gibson "borrowed" my bike and cycled on the parapet across the old road bridge over the Rosskeen Burn. I am sure he has more sense nowadays! Hi Ronald, yes I remember it well, if I went over the edge it would have been a 20+ foot drop into the burn. I've told many people over the years but no one would believe me, maybe they will now! Gordon! Can't believe you would do such a thing, who are the others in the photo? Does anyone have contact with Robert Kerr? Is he still living at Rosskeen? Rob Kerr is still in the same house - he seems to be using the bus more than the bike these days! I have not spoken to him for some time now.